Seoul is a paradise for shoppers : the mega city is packed with shops, outdoor markets, street vendors and mega shopping complexes. You can spend days, possibly weeks, browsing through the mazes of shops and store all over the city. One of the most exciting places to visit is Dongdaemun Market, the biggest shopping district in Seoul. It is a full neighborhood, filled with countless shops, selling about everything you can dream of! Today I want to take you to the Crafter's Paradise: the Dongdaemun Shopping Complex! The Shopping complex is a gigantic 7-floor building with thousands of vendors offer a head-spinning selection of crafting and sewing supplies. The basement and the first floor are dedicated to sewing supplies: millions of buttons, kilometers of thread, ribbons and trim, tons of buckles, zippers, patches, embroideries, etc. Trust me, it will make your head spin! The second, third and fourth floors are entirely dedicated to fabric. You can literally get lost in the sea of vibrant colors and textures, and the shopping complex is so unbelievably large and packed to the ceiling with goods. The second floor is specializing in silk and luxurious fabrics chosen to make the Hanbok, gorgeous and colorful traditional Korean outfit worn for wedding ceremonies and other important events. Take me to the 5th Floor, please! For me, the party begins when I reach the fifth floor, dedicated to Jewelry and Accessory supplies! There are hundreds of booths and the selection is mind-blowing : lace, ribbons, beads, charms, rubber bands, hair barrettes, pins and bands, feathers, leather, hardware, felt, polymer rings and bracelets, jump rings, fasteners, silver and gold chains, quilting supplies, etc. Visiting this market can be very overwhelming. As most places in Asia, it's crowded, buzzing and loud and, most importantly, packed with stuff! Most of the shops have boxes and bags of goods literally piled up to the ceiling. 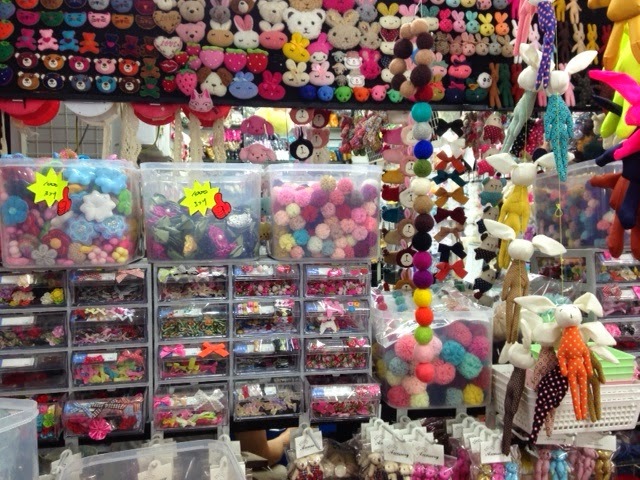 Many shops on the 5th floor sell beads and charms for jewelry making. Their tables basically look like bead buffets! You can pick and choose from their selection, using tiny bowls or baskets. Most of the things can be bought individually (prices vary from a few cents to a few dollars per item), but you can also negotiate a better price for a larger quantity. Asian shop owners are used to bargaining, so do not be afraid to ask for discounts. I would also recommend you pay cash for your purchases, as shop owners are more willing to give you interesting prices when you pay cash, rather than with a credit or debit card. Visiting this market (like most large shopping centers in Asia main cities) can be an overwhelming experience. The place is large and there are people everywhere; the concept of "personal space" is more or less inexistent in Korea, so you can expect to be pushed and pulled, and have people standing "in your bubble" all the time! To make things easier and more pleasant, make sure to go there without any shopping bags or large backpacks, as navigating the narrow alleys can be challenging. Also, I would recommend you visit the market when you have enough time to browse through the numerous booths and compare the different products available. The prices do not vary that much from a booth to another, but the selection does. The booths are numbered with a system similar to street addresses, so make sure to pick up the business cards of the shops you especially like, as you might have a hard time finding them again. Finally, remember that you can request your goods to be shipped directly to you by the merchant (ask for taekbae, 택배). This is very convenient, especially if you are purchasing heavy or large items. The cost of delivery on the Korean peninsula is between 3,000 or 4,000won ($3~$4), and it usually gets to you within 2 days. Maybe are you wondering : what did Naty buy at the Shopping complex?... 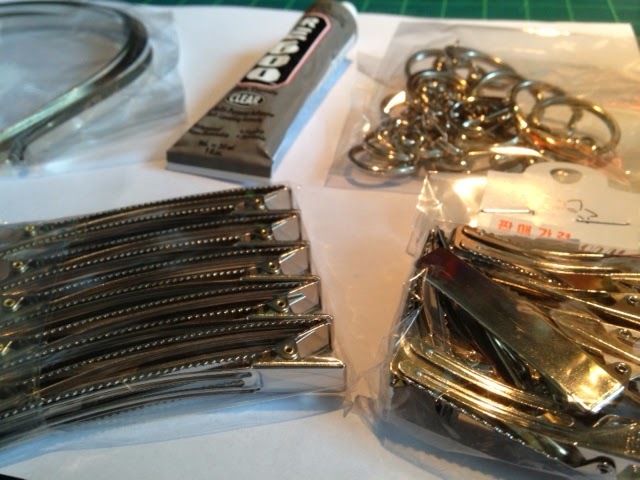 Well, this time I was looking for some hair accessory supplies, and I have found beautiful stainless steel Alligator clips, along with sturdy metal headband. I also purchased nice stainless steel key chains and key rings (did you know that Korea is famous for its high-quality stainless steel products? ), glue and other trinkets. 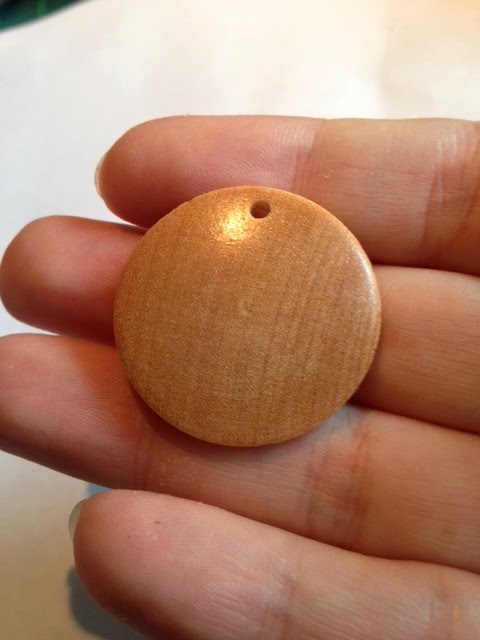 I have also found these very nice wooden discs with a slight convexity that will be perfect for new HanjiNaty earrings! 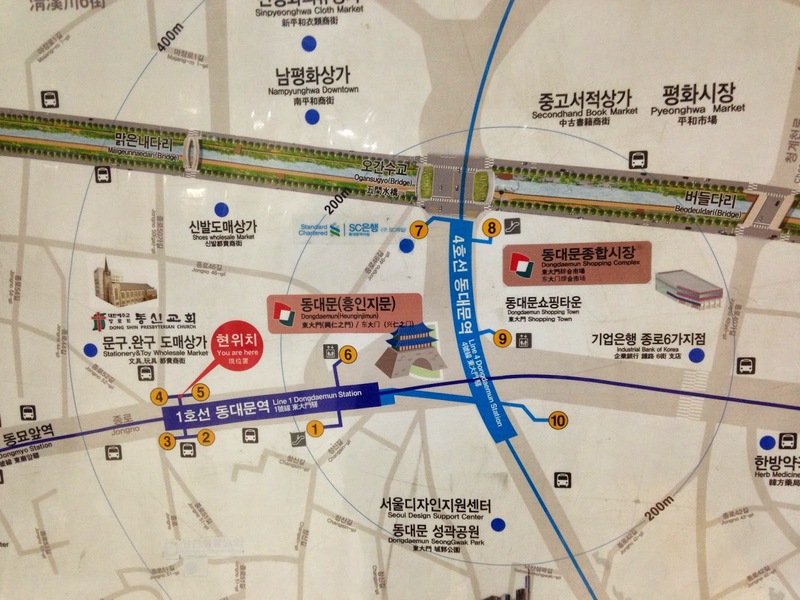 The easiest way to get there is to take the Seoul subway, to Dongdaemun Station. Take Exit no.8 and walk along the waterside. The Dongdaemun Shopping Complex is next to the JW Marriot Hotel. Oh my! I don't think I would ever leave! How long were you there? Fascinating article! Thanks for sharing such informative article. Can I check with you if you remember seeing any plastic DIY headbands while u were shopping for the hard sturdy ones? They do have plastic headbands, in many different widths and thicknesses! You will surely find them there! Hello! I am so sorry, it appears like I didn't write back to answer your question.... My sincerest apologies! Yes they have a good selection of headbands, both plastic and metal. Do you know if they sell Tulle here to make tutus? 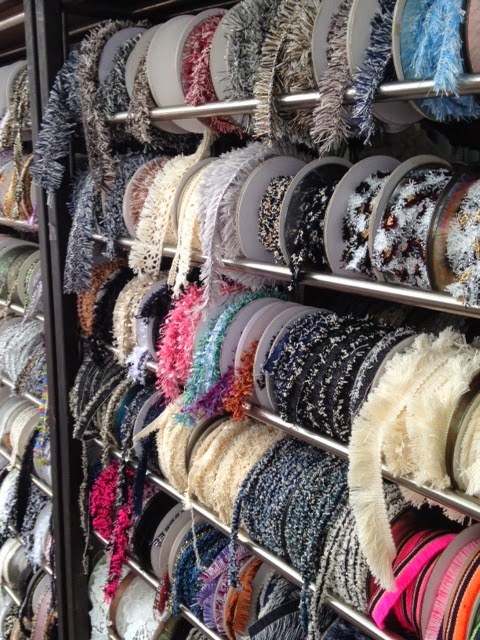 They have a very wide selection of fabrics, ribbons and sewing items, so I am 99,9% sure you will find tulle there! Do you know if they sell glitter paper and any papercrafting supplies? I don't remember seeing papercrafting supplies there. Your best choice for that kind of items would be 'Alpha' in Namdaemoon Market. It is a 5-floor stationery and craft store, and they have an amazing selection of paper, office supplies and craft supplies. Do they have feathers for use in costuming? They have a wide selection of sequins, feathers, ribbons, fake fur, etc. I am pretty sure you will find what you are looking for there! I plan on making a DYI Ring light to film well-lit videos, do you know if they have Green Wire Wreaths and LED Rope Lights? Can I find polyester filling in Dongdaemun shopping complex? I was at Dondaemun market and found the polyester filling at the shop that sells quilt materials. 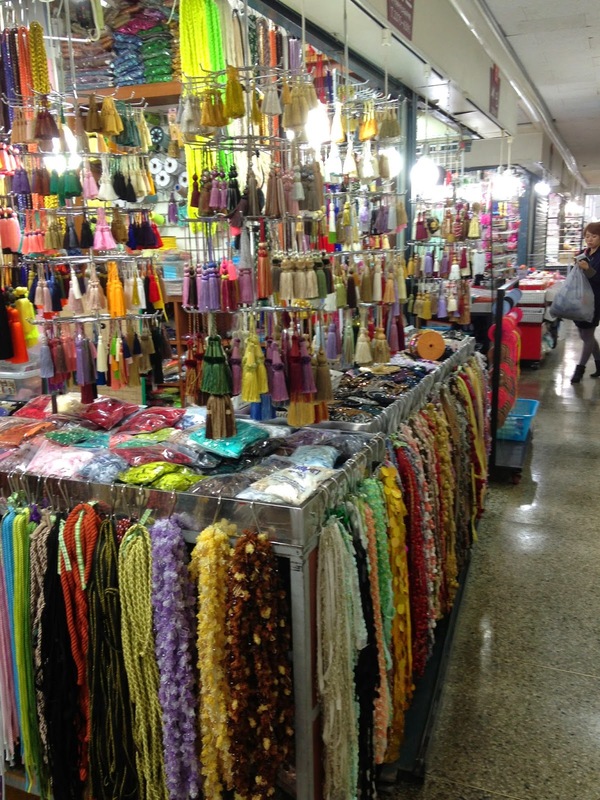 I remember seeing some stalls on the 5th floor that sell leather strips and laces, mainly for jewelry and accessories (bracelets, key chains, etc.). They also sell the hardware and tools (rivets, hooks, etc.) so I can only assume that they sell large quantities of leather. If they don't I think that these vendors would be the best people to ask when to find good leather in Seoul. I would imagine that there must be some leather vendors on the fabric floors (2nd, 3rd and 4th floor) but I haven't explored it much. Please let us know what you find when you visit in December! Thank you! I'll definitely go for the hardware/tools! I know there is usually a separate district for leather (in NY, and in China as well), so I'll keep searching for it. Do they sell original Korean jewelry supplies and finding or Chinese stuff? Is it a good place to buy in bulk for wholesale? They have original Korean items, as well as Chinese and Southeastern items. I know that the stainless steel hair pin and clips I buy are made in Korea-- there are all kinds of things there, the quality and prices vary so I am positive you will find what you are looking for. I have bought items in larger quantities before (and was able to negotiate a good price) so I would imagine it is possible to buy in bulk. 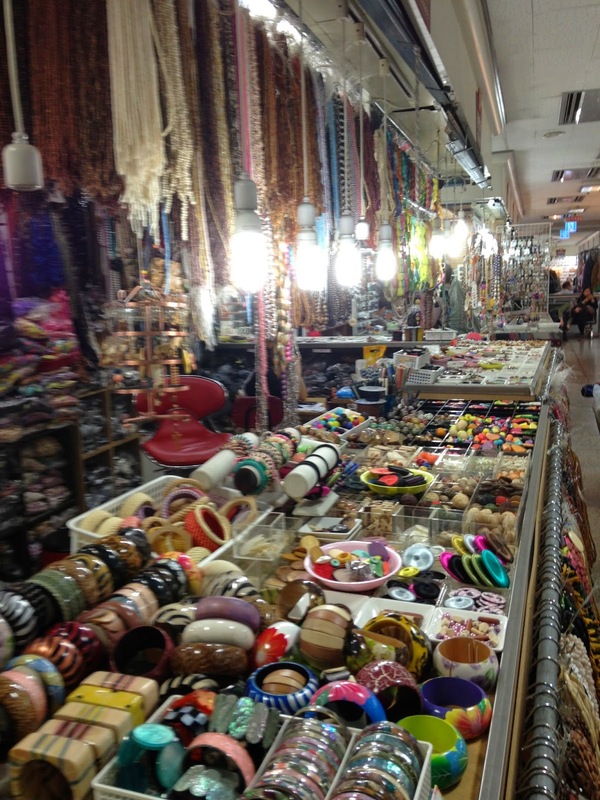 The vendors often have huge quantities of in the stalls, and most of them have online shops (gmarket) as well. Let us know what you find when you visit! 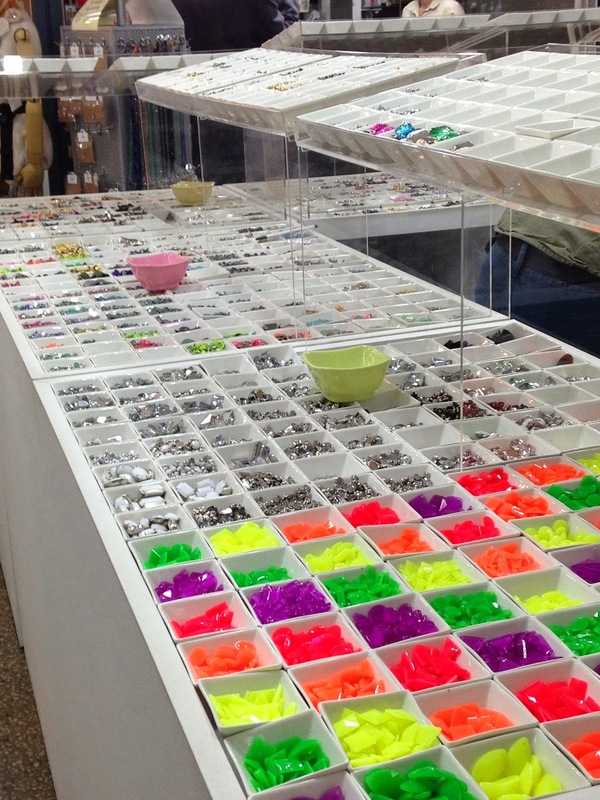 <3 i am living in Changwon now and i was wondering where to get my crafting (mostly jewelry making ) supplies! unfortunately i wont be going up to Seoul much this year, but i should be living there next year. sooo excited! Hi May I know where can I find good leather hardware (like hermes buckle) to put into my leather craft? I am flying to seoul for holiday and thinkin to look for that. Thank you. There are many leather craft vendors in the Dongdaemun Shopping Complex, so I think it would be a good start point. I do not know what the quality of their hardware is, but I would imagine some of them will be able to re-direct you to another vendor or location if they do not have what you are looking for. I would start there for sure. I hope it helps! Thanks Natalie for your info. Is sangsae dol is in Dong dae mun area? Do you know what time they close?